Purple Parking (formerly Airparks) offers a fantastically cheap car park on the outskirts of the airport. 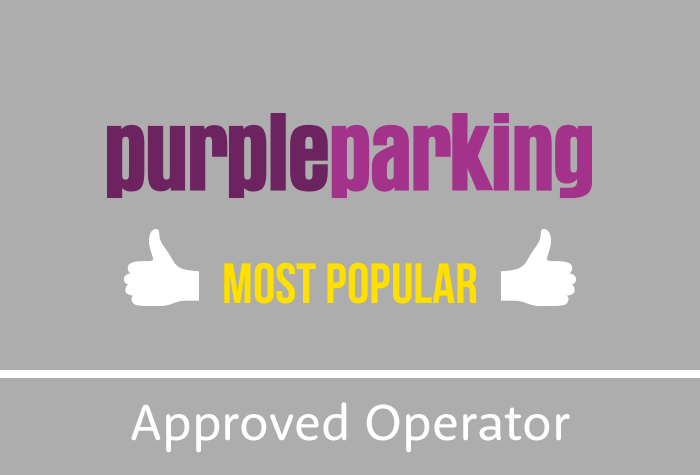 Get our flexiblePurple Parking for the price of non-flexible parking with our Summer Offer! Gatwick airport parking is rated, on average, 4 out of 5 by 22,672 Airparks customers. With free transfers to either terminal running every 15-20 minutes, Purple Parking is a very convenient car park for Gatwick Airport. To check live pricing and availability enter your required parking dates at the top of the page and when you're ready to arrange parking at Purple Parking you can do so through our easy online booking. You can see our full range of parking on our Gatwick Parking page. When you arrive at the Purple Parking car park, pull into one of the arrival bays then head to reception with your luggage, booking confirmation and car keys. Once you've checked your car in and handed over your keys a member of the team will park your car for you while you head outside to the bus stop. A free transfer shuttle will take you to either airport, it'll take about 10 minutes for the North terminal and 15 minutes for the South terminal. Top Tip: Shuttles run 24 hours a day so no need to worry if you have an early or late flight. When you return to the UK head back to bus stop; if you're at North terminal you'll need bus stop 6 or 7 - South terminal is bus stop 7 or 8. Wait for the Purple Parking bus which will take you back to the car park. Head to reception to collect your keys the you can jump in your car and head home. Please note: The bus may not have space for larger items such as surfboards etc.